A sophisticated group of conspirators was involved in the suicide bombing in Bulgaria that killed five Israeli tourists and a Bulgarian bus driver last week, and they spent at least a month in Bulgaria before the attack, the country's prime minister said Tuesday. Boiko Borisov's comments confirm suspicions that the suicide attacker who targeted a bus filled with Israeli vacationers last Wednesday did not act alone. However, the prime minister did not offer any evidence or give many more details. He didn't say how many people were believed to have been involved in attack on Israeli tourists in Burgas and also declined to back up Israel's claims that Iran and Hezbollah played roles. Those involved used "leased vehicles, they moved in different cities so as not to be seen together, and no two of them can be seen in one place on any security camera," Borisov said, speaking alongside visiting White House counterterrorism chief John Brennan. He described the people behind the blast as "exceptionally skilled" and said they operated under "strict conspiracy rules." He also said DNA samples from the suicide bomber have been shared with all partner security services, but no match has been found in their databases. "There was absolutely no chance of preventing such an act of violence," Borisov insisted. "We could have only detected it by chance or if we had been informed by the services that such activities were under way in Bulgaria." Brennan also stopped short of blaming Iran or Hezbollah, both of which are US nemeses, though he noted both Tehran and the Lebanese group had been implicated in attacks on civilians in the past. He said the US has been working with Bulgaria as the country tracks down those responsible. 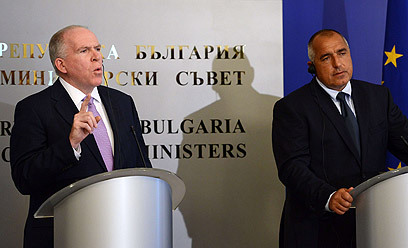 "Bulgaria will continue to have the full support of the United States in the weeks and months ahead," Brennan said. European security officials say that images of the attacker have not yet matched any of their databases but that it's possible the man was not on a watch list. Investigators know, however, that he was using multiple aliases and was wearing a wig and disguise when he was captured on closed circuit television, according to a European security official who spoke on condition of anonymity because he was not authorized to speak about the investigation. Israel's military chief insisted Tuesday that Iran and Hezbollah were involved and vowed that Israel would respond to the attack. "We will have to find a way to respond to this attack, and not just a one-off," Lt. Gen. Benny Gantz was quoted as telling the Knesset Foreign Affairs and Defense Committee. "We will know how to do it judiciously. Ultimately, the response will come." His comments were relayed by a meeting participant who discussed contents from the closed session on condition of anonymity. Also Tuesday, Israeli and Bulgarian officials held a memorial ceremony at Burgas Airport to pay tribute to the victims of the attack, with a minute of silence and the playing of the national anthems. Israeli Tourism Minister Stas Misezhnikov laid a wreath. Misezhnikov said that some 180,000 Israeli tourists visit Bulgaria each year, and that they will continue coming in the future as well. Since the attack, however, thousands of Israelis have already canceled plans to vacation in Bulgaria this summer. See all talkbacks "Bulgarian PM: Burgas bombers were here for a month"